Let the 2018 April India Expedition begin! We awoke early in Delhi to ensure our team would arrive in time for the 6 AM train heading northbound towards Kathgodam, Uttarakhand. The experience allowed our team a dynamic opportunity to think on our feet and really work together for the first time to navigate the station’s fast-paced environment. Looking out the window, we witnessed the landscape’s changing scenery. On the train, our team prepared for the literacy pretests, the baseline data necessary for our research. After six hours, we arrived in Kathgodam, loaded our bags and supplies onto the top of the bus, and began our journey into the beautiful and breathtaking hills. We, of course, stopped for a chai break along the way and tasted one of Uttarakhand’s favourite foods, Maggi, a noodle dish rich in local spices. Coincidentally, our bus passed the shipping container that will house the SiMBi solar powered classroom. This was by far a highlight. After three hours of windy, mountainous roads, our team arrived to the Guest House where we were greeted by Manoj and his team. Their warm welcomes and delicious meal have made us feel right at home. We ended the night in celebration of Sukriti’s birthday and reminisced about our long yet successful travel. We sat around the fire place, sipped masala chai, and went to bed in excitement for the following day’s projects to begin. The Walking School Bus - India has received Charitable Status! TWSB - India has received its charitable status accreditation! Since our initial integration of including Indian volunteers for our Uganda expeditions 2 years ago, to having an official registered entity in India, it has been quite an exciting journey! This is an incredible moment for TWSB India and TWSB as a whole. The accreditation allows TWSB to solidify its presence in India, and most importantly, enact our objectives and projects with the support and name of an established entity. The projects that have been so successful at the schools in Uganda, will now be extended to, adapted and implemented in Indian communities with limited resources. While this news is extremely exciting, the process to get to this point was not so simple. The Indian government tightened the process of registering a non-profit to ensure that their actions are in line with government NGO objectives. The rules of incorporation, banking and taxation were made to be much more stringent. While the process may have been tedious, it helped us to solidify our position over how we move forward with our operations in India. With such a milestone, it becomes easier for TWSB to enact its Indian projects and incentives. Most prominently, we are better able to involve more Indian volunteers, students and researchers, to continue furthering our research-based agenda. With this accreditation, TWSB’s mission in India is further legitimized and it better positions our teams to work at a grassroots-level and make even more of a tangible impact! Here, it is important to acknowledge and give extreme gratitude to Sukriti Sachar and her team in India who have worked so many hours and have committed endless energy to this process. Without their undenying commitment and motivation to this important project, TWSB has taken a gigantic step forward in increasing access to transportation, nutrition, and curriculum for students in India. Looking forward to what comes next! Learn more about how TWSB has evolved from its presence in Uganda to India here! Was it when we were bonding with students from Yonatan Netanyahu Memorial School? Or having a soccer tournament with students from Semei Kakungulu High School? Perhaps, when we were working alongside local builders and community members to construct our solar powered classrooms? Was it gifting our first school bus to students from Hadassa and Semei Kakungulu? How about when our fluency-testers were working with teachers and students to better understand the impact of our reading program as well as implementation through the solar power classrooms? Maybe in the construction and preparation of our community gardens? What about the installation of the chicken coops to add nourishment to our communities? We noticed one consistent theme among these various projects. We worked with local communities to not only create a positive impact but also to establish mechanisms that can be sustained by the communities themselves. Our work is inspired and led by our Think Tank, a team of talented researchers committed to improving access to education through our three-pronged approach to transportation, nutrition, and curriculum. Because making an impact isn’t just about the building of a classroom or adding a water catchment system. We make an impact by carefully applying our projects with guidance from our researchers, and then assessing their usage and implementation over time in collaboration with our communities. In collaboration, we ensure that we maximize impact by working alongside community members to research, understand, and implement our holistic and research-based approach. It was seeing this impact that was the most meaningful aspect of the trip. In preparation for our upcoming Uganda and India Expeditions, we continue to apply the same philosophy in anticipation of an impactful journey ahead! We are looking forward to reuniting with our friends and evaluating the progression of last year’s project implementations. We are also very excited to implement some new research-based solutions in more communities. The growth of The Walking School Bus over the last year has been truly remarkable. From the expansion of our projects in India to the growth of our team in Vancouver, and to the response from our communities in Uganda. These successes provide the motivation to continue growing and expanding, and especially to continue making an impact with our research. We’re excited about what’s in store! Learn more about our upcoming Uganda and India Expeditions! Giving Tuesday is November 28th: Help Us reach our goal! This year, The Walking School Bus is proud to be a part of Giving Tuesday. Giving Tuesday is the movement that celebrates giving back. Every year, many enjoy the benefits of Black Friday and Cyber Monday. Giving Tuesday gives us the chance to reflect on where we can give back to make the world a slightly better place. Thank you for being part of something big! Giving Tuesday was celebrated in 98 countries, was endorsed by impactful people and organizations worldwide, and generated millions of dollars for charities of all shapes and sizes. Our community came together this Giving Tuesday and helped us raise $800. With this money, we will help complete the construction of our next Solar Power Classrooms in Uganda and India. Today was by far the most rewarding and emotional day on this expedition! It will stand out as a vivid memory for our whole team and communities we work with for years to come. The morning started with the team taking a 15-minute stroll from the guest house to Hadassah Primary School, one of our participating schools who will be benefiting from the school bus. An automobile painter met us at the school were he expertly free hand painted TWSB logo onto the bus as well as the names of the three recipient schools. The children were overwhelmed, as where we, and they serenaded us in gratitude in both English and one of the local dialects. Hadassah's music program came in 15th place out of 15,000 schools in Uganda and the performance they put on for us, complete with a dance and warrior costumes and headdresses was more moving than any Broadway production. We all joined together and danced around the bus, grateful for the benefits it will provide. Sadat, the head of technology at the school gave a moving speech about the importance of education and how literacy starts from the teachers. He thanked Aaron and TWSB for providing a robust online library through the gifting of SiMBi and access to an abundance of knowledge through the gifting of an application called Rachel that is loaded onto our Raspberry Pi intranet systems. Following the gifting of the bus, we went straight to Mbale, a nearby city and bought a bicycle for John. The team then gifted this bicycle to John (Yonatan Netanyahu Memorial School's Math Teacher). All of us, John included, were overcome with emotion as we understood the positive impact this bicycle would have. John hopped on the bicycle, expertly rode it around, then came back to the group, hopped off the bike, and picked it up above his head! The aim of TWSB is to empower access, and today was all about providing it and understanding its importance. Giving the bus was an incredible experience that will help an entire community and giving John his bicycle will notably change his life. It was a special day. Today marks the last of our working days in Uganda and we have had a truly incredible experience. We're already coordinating upcoming projects and trips with our Uganda team and we cannot wait for our upcoming expeditions. Today was an early morning. We woke up at 6 am. to experience one of the defining moments that inspired Aaron to create TWSB - students journeying to school. One of the sources of inspiration for the founding of TWSB was when Aaron experienced students journeying to school. Many of them walk up to 8 km and when they arrive at school there is often no food. As we drove in the new bus, we passed hundreds of children gripping pens and pencils in hand. Today, something truly remarkable occurred. When we arrived at Putti Village, we got to work immediately. Micah, Elliot, and Eli spent the first 3 hours collecting bricks and mixing cement so that they could construct the base of a water catchment system. Liz, Sarah, and Micah each taught classes to the children and interviewed many inspirational residents of Putti Village. Michael took hundreds of pictures and conducted and filmed countless interviews as well. As we were getting ready to leave Putti, John approached Aaron and explained that he appreciated the offer to always have a spot on the TWSB bus but he did not want to take any spots away from students and wondered if TWSB could purchase him a bicycle. Initially, Aaron and the team were confused but John explained that with one leg, he was able to ride a bicycle. He ended up borrowing a bicycle to demonstrate and even gave Aaron a ride! The team decided that they would work to purchase John a bicycle. It was a truly special day that showed us the importance and impact of our work and the team left Putti in incredibly high spirits. Today, we were provided with the opportunity to walk through the Peace Kowerma Coffee fields. Peace Kowerma (Delicious Peace) was founded by JJ Keki, a member of the Abayudaya, after he witnessed the atrocities of 9/11 while visiting New York. There are Christian, Muslim, and Jewish coffee farmers and there the interfaith collaboration in the fields has brought a greater sense of prosperity to their communities. Walking through the coffee fields led us to a beautiful rock that forms a natural roof structure over looking a valley. JJ shared with us how that this rock acted as a synagogue for the Jewish coffee farmers when they were forced to hide their religion when Uganda was under the leadership of Idi Yamin. We sat beneath the rock while JJ recounted the story and then climbed up the rock to marvel at the beauty of the valley below. We finished the afternoon in Mbale, the closest city to us, where we purchased much-needed supplies for the following day. The rest of the day was spent doing research and prep work for the days to come! Our morning was monumental and we’ll always remember it! The bus that TWSB has been working to provide to benefit three schools: Yonatan Netanyahu Memorial School, Hadassa Primary School, and Semei Kakungulu High School picked us up from the guest house and dropped us off at Putti Village! A year and a half of work, research, fundraising, and legal documents have gone into this bus so when it arrived at our door step, we were speechless. The two drivers: Isaac (School Bus Driver) and Shabyan (Taxi Driver who operates the bus when it is not driving students to generate revenue) picked us up smiling the whole way. It was a joyous occasion. Compared to the bus we were in yesterday, which struggled up the muddy, windy roads, riding in our very own, significantly newer bus made us feel like royalty. We arrived at Putti to children whose happiness mirrored our own as they understood the positive effects that the bus will have on their lives and community. We quickly got to work laying more bricks. We finished building the remaining two walls which completed the construction of the main supporting walls. To improve nutritional diversity and help provide students with much-needed iron through growing crops such as spinach and dodo (a leafy green). To improve agricultural best practice by integrating agriculture into the curriculum. Micah put her teaching skills to use and developed a lesson that aims to improve primary (grade) 1 and 2 students' literacy skills. Aaron continued teaching the teachers how to use the SiMBi app most effectively as well as how to use the other incredible content on our servers (intranet systems) such as everything on Kahn Academy Lite, TED, and much, much more! Sarah, Eli, and Elliott finished laying bricks for the classroom compound. It was a good day. Following a busy day and a delicious dinner, JJ Keki, Enosh (Spiritual leader of Putti Village), and Seth (Head of S.K High School) joined us at the guest house for a class (or two) of wine. We discussed our work and its impact and we’re feeling incredibly fortunate to be working with such incredible communities. The team enjoyed a beautiful day off hiking and exploring the flora and fauna around Sipi Falls! Our team arrived in Entebbe on Wednesday. The remarkable group of Educators, Economists, Agriculturalists, Researchers, and Photographers journeyed to the guest house at Nabagoye Village, our home for the following 10 days! Following a 5-hour bus ride led by a police entourage (we felt like celebrities), we arrived at the guest house and settled in for the night. The following morning, Rachel and her daughter Halima, the guest house chefs served us the world's best omelets (we're not biased :)) and Aaron, TWSB's Executive Director led an orientation session and discussed the various responsibilities for the trip. After the meeting, we visited one of the incredible schools we work with: Semei Kakungulu High School and had a chance to bond and work with the students. Later, we ventured into Mbale Town, the closest main city to Nabagoye. We explored the vibrant market place and purchased supplies from the supermarket. The day came to a close with a beautiful sunset followed by thunder and lighting! It was a lovely day learning the lay of the land and working with our partnered beneficiaries! We are looking forward to implementing our projects! Micah and Eli, from Vancouver, are conducting reading fluency tests to ensure that the SiMBi app is fulfilling its purpose. Michael, our photographer from Hunter Valley (two hours North of Sydney, Australia), joined us in collaboration with Photographers Without Borders (PWB) and has been taking stunning photos, which will be featured on Facebook and the TWSB blog. 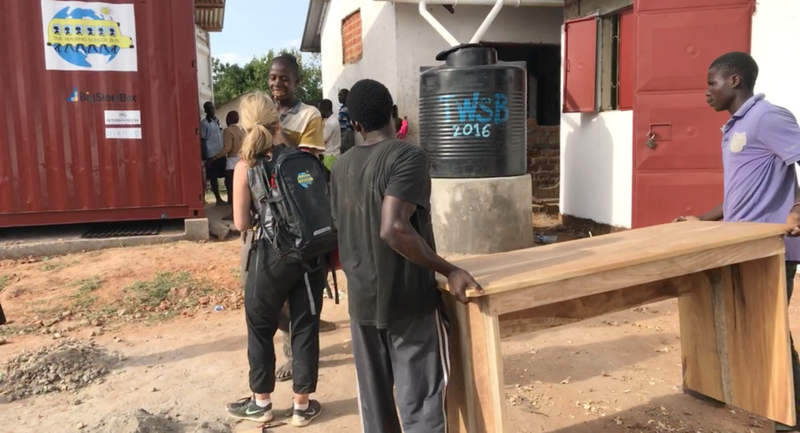 Sarah, a UBC Economics Student from California has joined us to monitor and evaluate the chicken coops that TWSB implemented on previous trips. Liz has joined us from Montreal where she is a McGill student. Her role on the trip is to help implement a CSA (community supported agriculture) Garden. Elliott, joining us from Vancouver, is working with locals from Putti Village to build the classrooms. Aaron, from Vancouver, is leading the team and guiding us to ensure that our projects are successful. On Friday morning, we happily awoke to the sound of cows and chickens and set off for Putti Village. Upon arrival, our team met with the communities leadership and teachers to discuss the projects for the upcoming week. We quickly got to work mixing cement for the new brick classroom we are building with assistance from local builders and community members. It was incredible to see how much of the classroom was completed in only a few hours and to be apart of the process! Understanding that in the near future, the children from Yonatan Netanyahu Memorial School in Putti Village will be learning in this classroom made the challenging work much easier and far more rewarding. Especially after seeing 3 full classes of students studying outdoors and the constant distraction the students and teachers endure. Sarah, who is monitoring and evaluating the chicken coops, interviewed the Putti Village leaders in order to understand its current condition, impact, and potential to generate revenue for the community. Liz, who is working on the CSA garden worked with students in Primary 6 (grade 6) to implement a more sustainable agricultural system. Working with the P6 students, they cleared and weeded the land. Micah and Eli worked diligently testing student fluency to understand the impact of SiMBi. Michael continued to capture the remarkable communities we work with in order to amplify there stories. Elliott and Aaron worked on a few projects including classroom construction and helping to prepare the garden. It was a productive and rewarding day that segwayed into a beautiful Friday Night service with the Abayudaya Jewish Community. We are no more than 100 feet from driving away from Putti Village and the feelings are indescribable. The immediate reactions were awe and astonishment as to what we helped create. 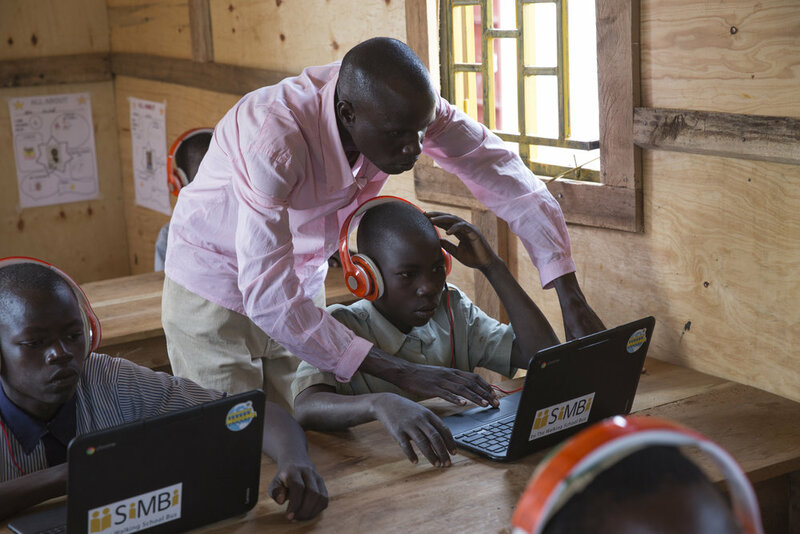 Our team of 15, along with dozens of local workers built a solar-powered classroom in the middle of rural Uganda outfitted with tables, chairs, wifi and computers. The finishings still require some work but that will be added in the coming days. Putti Village is a place so poor with no future in sight for the local community. Some are fortunate to send their children to schools elsewhere and take small steps to try and offer a future of some sort to their children and families. I remember driving away from Putti Village with Aaron 8 months ago with heavy hearts wondering what we could do to offer more hope to the village. We knew we would be back and immediately began planning. We identified key areas to target: Literacy, Technology, Books, Educational resources, Tuition scholarships, Water, Food (Nutritional Diversity) And some fun! We spent months further developing our reading app, "SiMBi". It is still a work in progress but offers a comprehensive reading program beginning with sounds, words, sentences, paragraphs, and stories. The question became - in a world of billions of cell phones and technology, how can we incentivize reading through an available and free app. A few of our solar panels used to power the classroom. We chose to do our work in Putti Village because of the relationship Aaron developed with the community years ago that we have nurtured and continue to cultivate. They have become our Ugandan family. There is a great deal of mutual respect. At the core of our work is a collaboration with our Ugandan leaders. We make suggestions for improvement based on their needs. The role of TWSB is to meet their needs. We endeavor to support the local economy whenever possible. We feel our approach goes a long way to strengthening these relationships and the trust they have in us and vice versa. 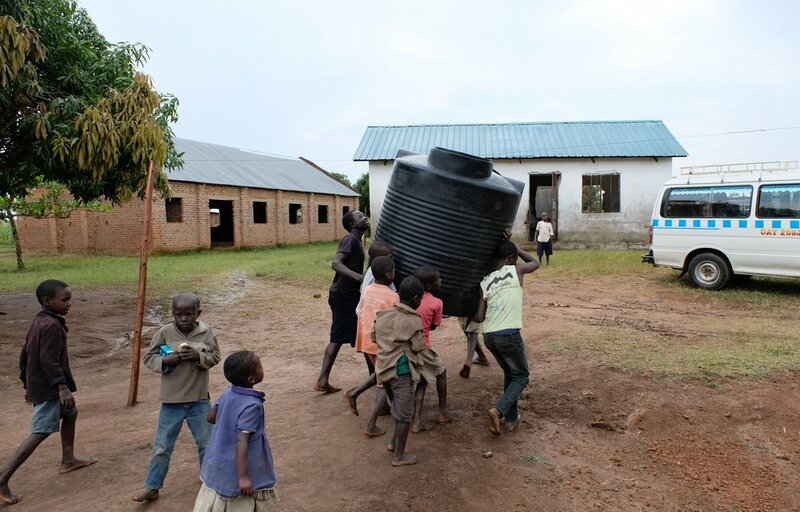 We built another water catchment at Putti and a chicken coop at Semei Kakangulu High School. We passed out one hundred soccer uniforms and balls thanks to the generous and continued support of Stormtech. While the students appreciate our nutritional work, specifically the water catchment systems, the look on their faces when unwrapping the uniforms was truly beautiful. Following the soccer game, the team got to work to ensure that the classroom would be brought to fruition before our departure. It wasn't easy but watching as the previously disparate pieces came together was truly a spiritual experience. Our 15 volunteers and Putti Village family sprang into action! Within 20 minutes, the container had become a beautiful classroom that the community couldn't believe belonged to them. As our group entered the classroom and sat down at the tables and benches that we had helped build and sand. The magnitude of our impact settled in. After a brief tour of the classroom and ensuring that the subtlties: wiring, locks, wifi, computer passwords, and offline reading applications were all functioning, we left the SiMBi Classroom. Ultimately, we were able to sponsor 17 students and pay for their tuition. We helped an additional 3 brothers who shared their story with us and we purchased their basic living necessities. We ran book drives and school supply drives in Vancouver and carried 30 duffel bags with us. We built a library and filled it with children's books and school supplies. Wow-what an incredible week!!! We are all tired, dirty, exhausted and above all happy. As I type this, I'm at a loss for the right words to open a window into our experience. A HUGE thank you to all of our volunteers- you were all amazing. Each and everyone of you had your hand in all of the projects- whether it was sorting, painting, sanding, carrying bricks, mixing concrete, photographing, videoing, testing the students, teaching, or building - we did this together. Our group was supportive, shared resources, and kept each other going. These trips are hard physically and emotionally. We lived together in a guesthouse lacking many comforts- air circulation, water to shower, inedible lunches and power. The effect is cumulative. Yet, when we asked 6 teenagers if they would have preferred to be at the resort down the road, they all echoed the same sentiments... We like living within the community... We like the homemade cooking... We like living closer to the people we are helping... We like the authentic feeling... That is not an easy choice. However, it didn't feel right to these remarkable young adults to live with excess and luxury- the juxtaposition too great. Sorting through backpacks, stationary, and clothing donated by the many generous families from Vancouver. Nicole teaching teachers from Yonatan Netanyahu Memorial School how to use SiMBi - our reading app. Tyler and Justin helping to organize the new library. For all that we gave Putti Village, the gifts and lessons they showed us were far greater. They changed our lives in ways we haven't processed yet. Our hearts are full. We thank you to all who donated, purchased supplies, an followed our journey with your incredible encouragement, love and support. It takes a village, or 2 in this case, to achieve what we were just able to do in a short time. We all have the power to effect change and improve the lives of people who have been marginalized whether local or abroad. Stay tuned for our July trip. We were able to identify a great need and the wheels of the bus are already in motion. We will be back on July 19th!! We have had an incredible weekend. Saturday was a day off. We went on a beautiful hike on the slopes of Mt. Elgin to Sipi Falls. We hiked the falls and walked through the lush rich coffee plantations. The views from the top of the mountain were spectacular. We enjoyed seeing the country side and taking a much needed day off to talk and reflect upon the work we have been doing. This morning (Sunday) we retuned to Putti Village. The progress on the reading room is unbelievable. The windows were cut and welded, and the solar panels went up on the roof. It is a beautiful sight to behold. The team that has been working on the library completed the room today. We carried 6 duffel bags full of books and school supplies and sorted and loaded the shelves. The Putti teachers and staff were blown away by the amount of materials be brought. While I was unloading supplies, one of the teachers asked me what the pencil sharpener was. I took a new pencil and showed her how to sharpen it. She had never seen anything quite like it and quickly went to get the other teachers so I could show them. The same happened with the glue sticks. It's hard to imagine things so basic and items we take for granted are so rare and special here. Additionally, we stocked the shelves with educational resources and text books. What an incredible accomplishment for our team. We brought a few computers with us and began to teach the teachers how to use the reading app. It was quite an overwhelming moment to see the app working in Putti Village after a year of testing, writing and building the app. To see it in use in a village like Putti is nothing short of remarkable. Tomorrow we will bring the remaining computers and load up the classroom. The tables and chairs have been built and tomorrow we will load up the container and make it look like a classroom inside!! The anticipation felt by us all is mounting. Tonight is our last night as a group as 6 people are leaving tomorrow after we finish our work and heading off on safari. It is a mix of emotions for us all. We came and accomplished so much in a short time. We laughed and worked and will forever be friends for the experience we shared. We started in Putti Village working diligently on our projects. The classroom and library are coming to life on schedule. There was a buzz in the air with our team of volunteers working side by side with the Putti Team. There is something quite magical taking place here. Two of our amazing teacher volunteers brought an activity for the students: they took Polaroid pictures of each student and left them with an "All About Me” activity that we're hoping to see on the walls next week!! We finished the book shelf and began constructing a second water catchment for the village. The 1000L container we left for them last summer has proven to be effective and time saving. The community is so appreciative of the accessible water. No matter how much time you spend in these villages, the time spent collecting water is always sad to see. The shipping container looks more like a classroom than a container at this point. The roofing began today and painting was completed. The desks and chairs were varnished and ready for use. We spent time going through the educational resources with the teachers today only to learn they have no primary reading material. They are introducing Grade 7 next year and can't afford books. They are missing primary math sheets and have no science materials. With money donated from St. Georges, the Saints boys went to town and bought all of the missing books. We are pretty excited to fill their shelves on Sunday with a new library full of resources and books! We spent only half of the day at Putti and headed over to the High School for the afternoon. A group of boys approached us the other night explaining that they are orphans and are suffering because they have no soap, sugar, clothes, bedding, clothes, toothpaste, tooth brushes, and shoes. Two of our team members purchased all of the items on their list and we gifted them their basic needs. They were overwhelmed and shook our hands many many times. It was a true gift to be able to help these boys albeit in a small way. Then on to the soccer game. We organized a game with Semei Kakungulu High School. We handed out uniforms to 50 of the boys and girls; 25 black and 25 maroon that were donated by Stormtech. It's an incredible moment to see the expressions on the kids faces when they are handed a new shirt wrapped in plastic with tags on. The most surprising part of passing out the shirts was when the little kids picked up the discarded tags and wanted to keep them as toys. We stared in disbelief when they wanted to keep them as toys. Nicole quickly turned one into a paper airplane and we all followed suit. Amazing how when you have so little, even a discarded price tag has value. 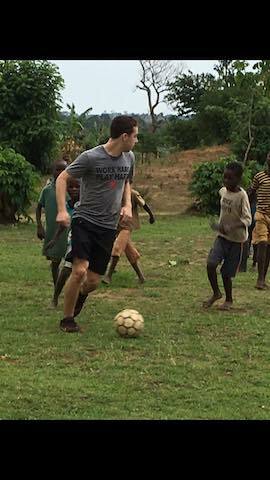 We gathered around the soccer pitch and first watched the students play a quick game. Then it was our turn to take the students on. We had so much fun playing with/against the students. The pitch is set overlooking the mountains in the most beautiful setting. We had an incredible time. After washing up, we set out to the newly built synagogue and joined the community as they welcomed their Sabbath with all faiths in attendance. Our group has bonded in unimaginable ways and the feeing of happiness tonight in the guest house was palpable. Another busy day in Uganda for the Walking School Bus team! After a good night’s sleep, we headed back on the bumpy road to Putti Village. Again, we were greeted by loud cheers and so much excitement from all of the children in the school. Seeing their smiles and happy faces was the perfect way to start our working day. After saying our hellos, we took out the soccer balls that we had brought with us all the way from Vancouver. The excitement was contagious and within seconds, a game began. Seeing how even the small gift of a soccer ball can bring so much happiness was a beautiful sight. Once we had a chance to play with the kids, the team rolled up their sleeves and got to work on the different projects that we had started the day before. Now that the library was cleaned out and painted, the team began to build bookshelves to hold the donations of supplies and books that were generously donated by so many people in the Vancouver community. Although the design of the bookshelf had to be modified to accommodate the resources that were available, the team was able to problem solve, build and sand most of the bookshelf that will be ready for varnishing tomorrow. We are all very excited to see the end result in a couple of days. 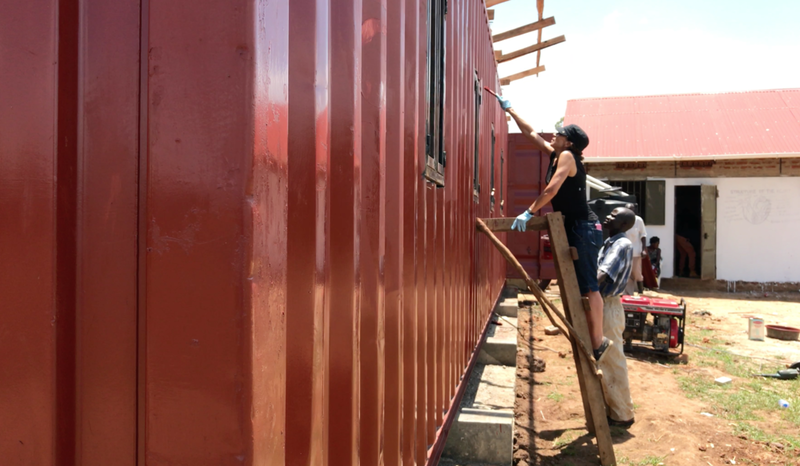 Work on framing inside of the container continued and the progress has been steadily moving ahead thanks to the hard work of the men in Village and Aaron who worked into the late hours of the night. Only in Uganda is work done by candlelight when the generator goes! Testing continued today and a few members of our team began working with the teachers at the school to gather information about each student’sbackground, nutrition and reading backgrounds. With help from teachers, students and a lot of perseverance, we managed to collect surveys from all of the students. Hearing first hand that so many students walk over an hour to school on an empty stomach was a reminder of the importance of The Walking School Buses nutritional program. While our team worked with the students to collect data, there were many opportunities to connect with the students - at one point, an impromptu singing session broke out… who would have guessed that the hokey pokey is universal? A highlight was the children standing to sing the Ugandan anthem. In addition to sponsoring 10 students at the High School, we also received funding to sponsor 5 additional students at Putti Village. Wanting to have an equal split of Jewish, Christian and Muslim students, TWSB added another student to sponsor. We met the students, all of whom are orphans and live at the school. I wish I could explain the abject poverty in which these children live. They live in a shed no bigger than a closet and all sleep on mats on the floor. Their meager belongings are strewn over a makeshift clothesline above them. What a gift to be able to offer these children hope of a brighter future. After a hard day’s work, the team drove to the home of the legendary founder of Delicious Peace Coffee Cooperative, JJ Kekki. JJ led us up a mountain trail to the Rock Synagogue which overlooks the farms in the valley below. As the group sat on the edge of the rock, JJ shared the history of the synagogue which was used by the Jewish people in the area in the 1970s to practice their religion in secrecy. He told us his story and the inspiration behind his collaboration with the Christian and Muslim farmers. The wind and clouds created the perfect backdrop. JJ welcomed us all into his home just in time to escape from the downpour and then ended the afternoon on a beautiful musical note. After months of planning and dreaming of building a classroom, we finally arrived at Putti Village. The team at Putti had been working as hard as we had been working from our end in Vancouver. And finally, today we began working together. Last week, the team at Putti laid the foundation necessary for the arrival of the shipping container. On Monday, the 40 foot container was delivered from Kampala and offloaded by a crane. The wood had been purchased with much input and guidance from our friends at Big Steel Box in Vancouver. There have been so many moving parts. We accounted for everything except the huge downpour and early morning loss of power (that we were supplying). I think that's the best part of working in low income countries- everyone is so resourceful and calm when the unexpected happens. Last summer, we had the chance to see their lack of supplies. After speaking to the teachers, we knew we wanted to return with school supplies, books and teaching materials. 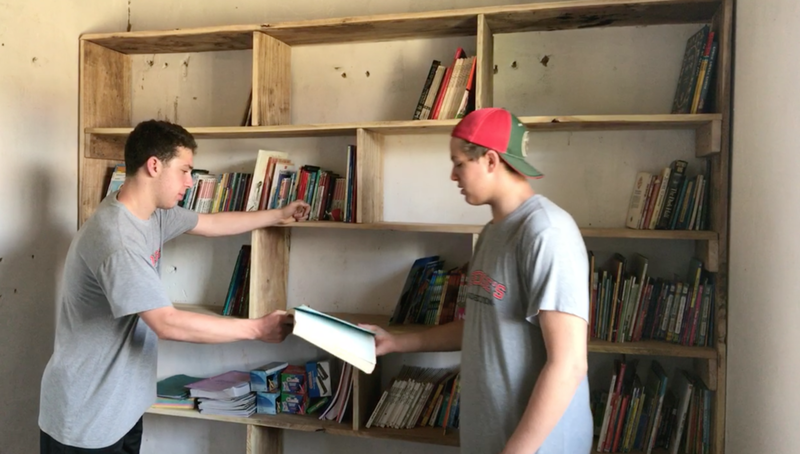 Today that goal became a reality when we cleaned out a small room, ripped out the termite infested book shelves and threw away all of the old used donated books that are not even intended for children. We cleaned and swept and painted the room. Tomorrow we will build the shelves and load them with books and supplies! We began testing the students. We need baseline word counts for all 143 students in order to measure the efficacy of the reading program we implement. We tested outside in the hot sun with children gathered around to watch. It's amazing the students were even able to focus in the midst of the commotion!! The organization for the work needed for the container took much longer than we anticipated. There were so many teams that needed to be coordinated: the framing, the windows, rust removal, painting, solar panels and on and on. Just when the framing really started taking shape, it poured. In some ways it was a welcome relief to the extremely hot sunny day. The afternoon was busy with everyone working on their projects and, of course, spending time with the students and staff. It's a rare experience to really sit and talk to people who live in the poverty we are seeing. Their lives are hard just trying to provide food and water for their children. Many families live with orphans and have up to 15 children living in very small spaces. Yet, they welcome us to their villages with open hearts and smiles- you would never know. Today was eye opening and inspiring for all. We can't wait to return in the morning!! On Sunday, 5 different groups of volunteers left Vancouver and met up in Brussels, while 2 from India made their way. Over 40 hours later, 15 volunteers from The Walking School Bus met in the Entebbe airport. We gathered our 30 duffel bags loaded with school supplies, backpacks, computers and books and travelled the bumpy road to Nabugoye Village together. For many, it was an especially exciting journey, as they have never been to Africa, while the rest of us could not wait to be reunited with our friends here. With special thanks to the St. George’s School community, we brought with us hundreds of pencils, pens, erasers, sharpeners, markers, books, backpacks and paper. Our team spent hours sorting through the supplies so we could deliver them to the three schools. Additionally, with special thanks to Stormtech, we brought 100 school phys ed uniforms: shorts and t-shirts for 2 schools to be able to play in two teams. The sorting was incredible and we all worked together for several hours to ensure the right supplies went to the right schools. We have an incredible group on the ground with us! Our first stop this morning was Semei Kakungulu High School, an interfaith school comprised of Jewish, Muslim and Christian students and leaders. We had the incredible privilege of meeting 10 students who learned (in front of us) that we would be paying for their education for the next 5 years with tremendous thanks to a special donor family in Vancouver. The students were overwhelmed, their smiles so bright as they clapped and were completely surprised by the news. One by one they were called up as scholars deserving of this incredible scholarship, It is a moment that will be forever etched in all of our hearts The Head of School spoke to us for some time about the importance of interfaith collaboration; about the importance of standing side by side for the goal of educating their students. He spoke of celebrating all holidays together- they are a true community, one we are proud to support. A big takeaway for many was hearing about the impact of educating one child in a family. One child’s education can take an entire family out of poverty. The cost of educating these children for a year is roughly 250/year with incomes ranging from between 1 and 2 dollars/day. It is a lot to take in, and such is the journey on a trip like this. As we left Semei Kakungulu High School, we were sorry to leave the students beautiful smiling faces. The afternoon was spent walking around the town of Mbale. They have a spectacular market filled with everything imaginable: fruits, vegetables, fish, meat, clothing and on and on. Following the market, we went to a variety of equipment shops where we purchased additional materials for our solar reading classroom and chicken coop projects. An early night will be enjoyed by all as we settle into the Guest House on top of Nabugoya Village. Aaron and I pass one another bricks to help with the construction of our water catchment system. It was world students day this week. No better time to narrate a little backstory on something marvellous that is brewing. Two flights from Bombay to Delhi, hours apart. Two passengers – one all excited to ‘Tedtalk’ with students for the second time, and one – moving from one project to another, impatient and restless. Whoever thought defective wifi systems would take me down a path I was going to love and to a land that was going to inspire me. A man, soft spoken, weirdly comfortable in a foreign country, comes up to me looking for the airport wifi details. And I must have come across as someone who is weirdly comfortable talking to strangers- offering personal hotspot as an effective alternate. Putting on a brave face, Aaron refused at first- but eventually had to give into the pressures of work and got talking, over hotspots and our work. Here I was, sitting with someone who didn’t seem as young as I got to know later – because of two things he was so sure of. Two things that bring so much more meaning to our ordinary lives. How does he find time? How does he find the people to support and actually do something? How does he do it? More importantly, how can I do it? How can I be part of it? Questions that were going to be answered step by step over the next few months. It was a 20 minute stranger- meets- stranger session. And none of us would have given it any more importance- had Aaron not invited me to his next TedTalk, had we not spoken about the Uganda trip and had I NOT ACTUALLY GONE WITH TWSB to Uganda. Those 10 productive days that we all spent working together, helping students and each other – they were nothing if not inspirational. Everything that we learnt in Uganda, is applicable in India- THAT was the reason I wanted to be an integral part of this entire programme. People questioned my objective of going to Uganda, because they didn’t see any value in me going to another country to do this. But if travel has taught me anything, it is this – There is no difference in how humans across countries react to things. Human behaviour isn’t limited to boundaries. And neither is selflessness. The one person who pushed me to do this and helped me think beyond is Mr. Roshan Abbas. But I know, that while I was there – there were a lot of people back home – following this journey, sending their love to the kids and the team, hoping we’d be doing something useful for them. I was counting on these people. And they DID NOT disappoint me. We now have a team up and running in Delhi, India. Mahima Jauhar (Event Manager), Abhilasha Nandal (Product Designer), Elvy Alias (News Anchor) and me, Sukriti Sachar (Content Designer) – that is what the TWSB Executive team (Delhi) looks like. We are up against the biggest competitors – inaccessibility to education, inadequate educational resources and closed mind-sets. And it doesn’t matter that all of us have different backgrounds, different skills, are from different parts of the country, in different phases of life. We are ready to put it all to use for something incredibly meaningful. What matters is – It’s all heart. Today we woke at 6 am in the simple elegance of our thatch roof huts. We gathered for breakfast under a full moon and ate delicious Spanish omelets while sipping locally grown coffee. Astro Photography shortly before breakfast. Shortly after, the group set out for a day of hiking and exploration. Our morning safari ended at the banks of the Nile River. From there, we spotted: giraffe, elephant, water buffalo, a variety of monkeys, hippos and crocodiles! Following our morning Safari, we all boarded a barge and crossed the Nile. Across the Nile, we continued to Murchison Falls where we hiked above the rapids and were able to enjoy the mist swelling upwards. Our Safari came to a wonderful end at 7PM when we stumbled upon a pride of Lions and enjoyed each others company until sunset. As the sun started to dip behind the majestic African horizon, I found myself thinking how incredibly lucky I was to have had experienced today and to have shared it with such a remarkable group of people. Eli, Michelle, Samantha, Lainie, Ally, Lynne, Shirley, Leo, Dan, Ruchi, and Sukriti. Thank you for making this first expedition the most productive and meaningful trip I could have ever hoped for. Thank you for believing in The Walking School Bus and helping make our vision a reality. Thank you for your passion, care and willingness to help out wherever needed. It was a privilege to spend the last 2 weeks with all of you. 25 hours of air travel. 11-hour bus rides. 12 enthusiasts. 7 countries. That is what it took to get the wheels of The Walking School Bus rolling.